Figure 2	Order parameter S2 for the (black line) and (red line) dihedral angles of topo I. 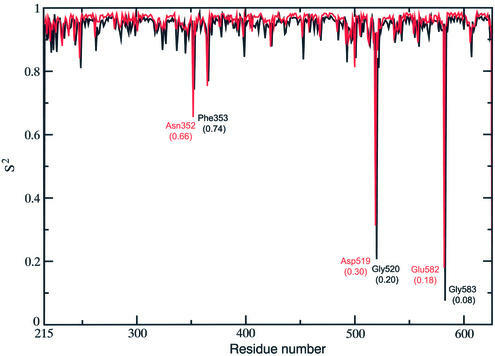 The six residues with the absolute minimum for the two angles are reported with their respective S2 value in brackets.. 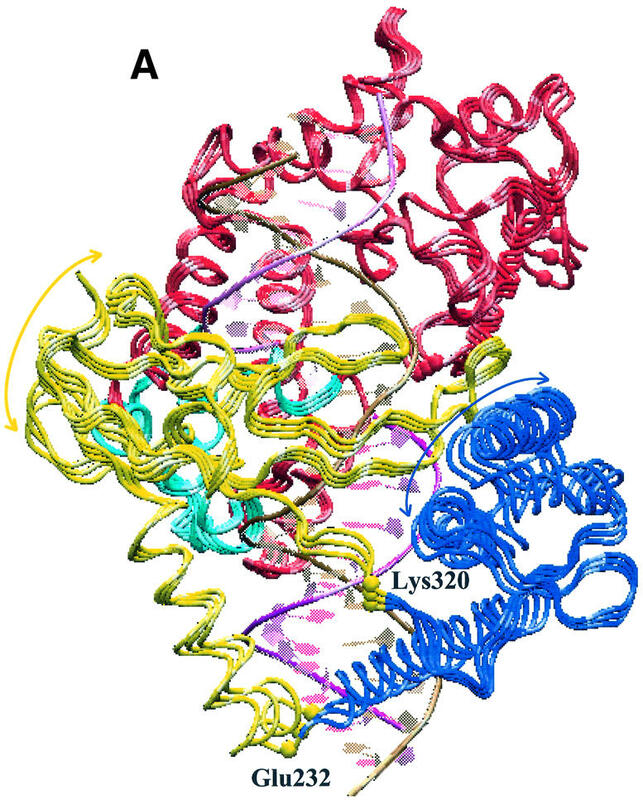 The collective motions of the core and C terminal domains of human topoisomerase I (topo I) have been analysed by molecular dynamics simulation of the protein in covalent complex with a 22 bp DNA duplex. 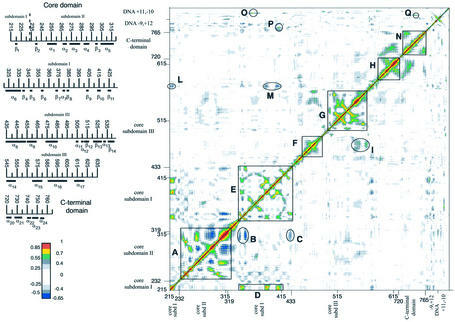 The analysis evidenced a great number of correlated movements of core subdomain I and II residues, and a central role for helix 5 in the protein DNA communication, in particular with the scissile strand downstream of the cleavage site. 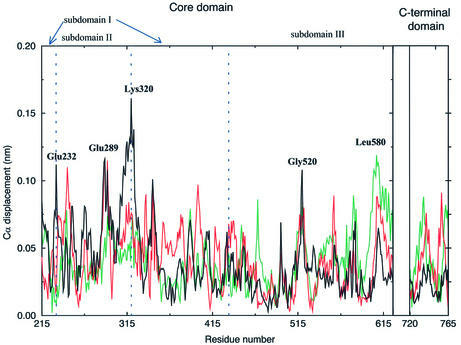 The flow of information between these core subdomains and DNA suggests that subdomains I and II play an essential role in the DNA relaxation process. In core subdomain III the majority of DNA contacting residues do not communicate with protein regions far from DNA, suggesting that they have a structural role. 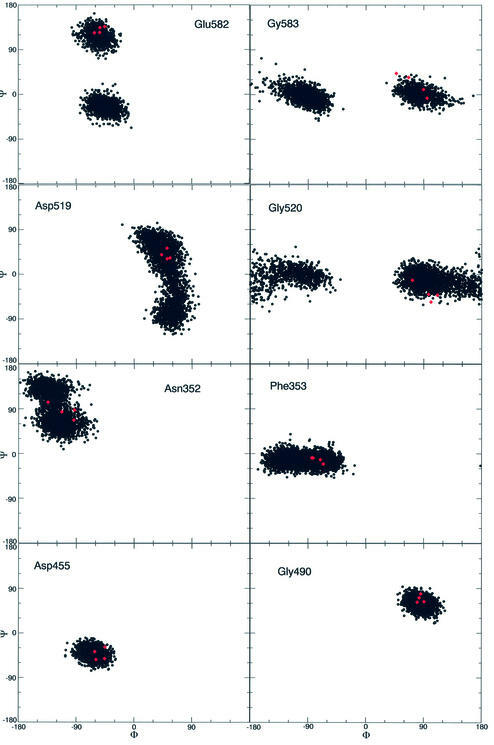 However, selected core subdomain III residues, involved in the orientation of the active site region, show correlated movements with residues distant from DNA, indicating that the information concerning the catalytic event is also transmitted. 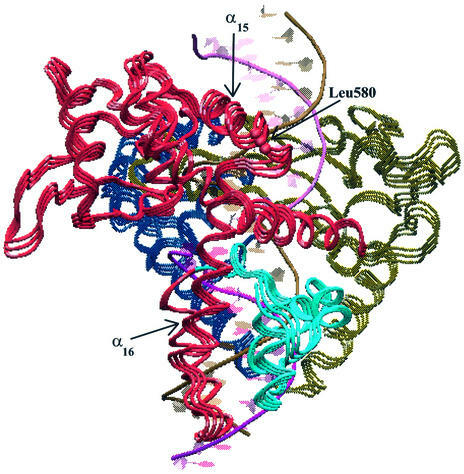 The flexibility of two loops formed by residues 519 520 and 580 584 seems indispensable to the dynamic participation of core subdomain III to the DNA cleavage and religation steps. The motion of specific residues has also been found to explain the effect of single point mutations that make topo I resistant to the anticancer drug camptothecin.